In its (rare) pure form, it is typically a rose-red color, but impure specimens can be shades of pink to pale brown. It streaks white, and its Mohs hardness varies between 3.5 and 4. Its specific gravity is between 3.5 and 3.7. 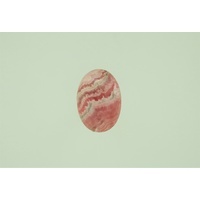 Banded rhodochrosite is mined in Capillitas, Argentina. Catamarca, Argentina has an old Incan silver mine that has produced fine stalactitic examples of rhodochrosite that are unique and very attractive. Cut cross-sections reveal concentric bands of light and dark rose coloured layers.